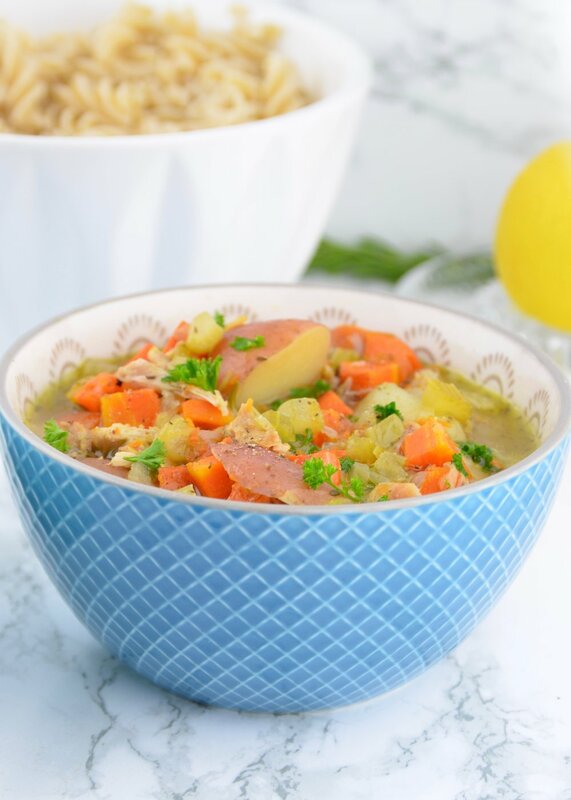 There is nothing like a bowl of chicken noodle soup to warm yourself up with on cold and dreary autumn days. It also helps when there are a few immune boosting ingredients to keep you healthy during the cold and flu season. This recipe is a great one to prep in advance. Simply chop up your vegetables, place the sea salt, pepper, and herbs on top and store them in the fridge. Keep the veggies you are going to sauté (garlic, onion, celery) at the beginning separate. This recipe takes 10 or so minutes of prep and 30-35 Minutes in the Instant Pot. Very little hands on time for an extremely nourishing bowl of soup. When you are at the butcher, stock up on soup bones. Freeze them and use them as needed. You can also keep a large jar in the freezer handy with ginger root, turmeric root and chaga (if the chaga has already been used). Throw into soups and broths as needed or grate to use in dressing and marinades. Having these ready to use in the freezer will help to ensure you are providing your body with immune boosting ingredients every chance you get! Want to know more about boosting your immune system? Book now for a free 15 minute introductory consultation. Disclaimer: the information provided in this post is for educational purposes only. It has not been evaluated by the FDA or CFIA. It is not intended to diagnose, treat, cure, or prevent any disease.